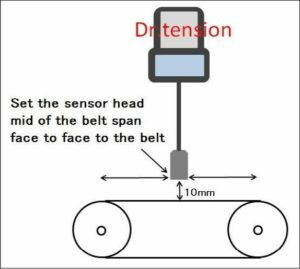 ++New++Contactless belt tension–Doctor tension Type-Ⅳ（Mitsuboshi） « TOKYO BELT CO.,LTD. 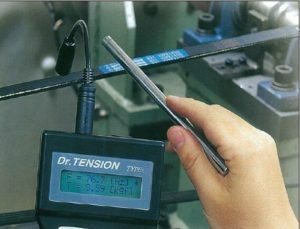 ・To show a belt performance of transmission belts,one of the most important thing is proper tension strength. 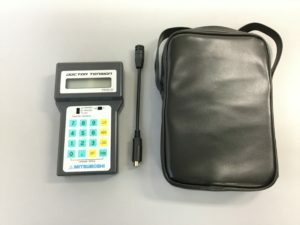 ・"DOCTOR TENSION TYPE-Ⅳ" is contactless belt tension gauge measuring sound wave.You can measure belt easier than now! 4)"Frequency of sound wave"and "Temsopm strength" can on the screen at the same time. 5)Can Choosing [kgf] or[N] available. 8)Can choosing Japanese or English. 1)Turn off the power of driving system,confirm the standstill of belt-drive. 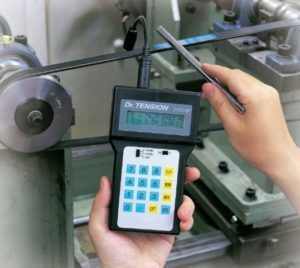 2)Turn on the "Dr.tension",input a date of belt condition. 4)Hit he Belt by a grip of a screwdriver etc.&make belt vibrate. 5)Measure several times&record the average.